Sinusitis is an inflammation (swelling) of the mucous membranes that line the sinus cavities. Acute sinusitis often goes away in a few weeks, either on its own or after treatment. If sinusitis lasts less than four weeks, it is considered acute sinusitis. However, for many people, sinusitis is a chronic problem. For these people, longer-term medicines may be necessary. Sinuses are a part of the upper respiratory system. 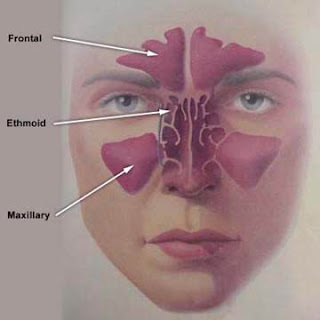 Adults and older children have four groups of sinus cavities (maxillary, ethmoid, frontal and sphenoid) located within the bones surrounding the nose.. Under normal daily conditions, the sinuses produce up to 1.5 liters of mucus per day. Allergy, infection or environmental triggers may increase mucus production or change the characteristics of the mucus in the nose and cause symptoms. Each sinus cavity has an opening into the nose to allow for drainage of this mucus. Therefore, anything that causes swelling in the nose may lead to obstruction or blockage of the sinuses leading to infection and more sinus problems. To work properly, the sinuses need adequate mucus drainage and a functioning immune system to fight off infections and inflammation. Sinusitis can be either acute or chronic. Acute sinusitis is often caused by a viral respiratory infection that in some cases leads to a bacterial infection; the condition is short term, resolving once the infection has run its course. The common cold, allergies and factors in the environment are the most common triggers for the development of sinusitis. Other important factors may include tobacco exposure, nasal septal deviation, nasal polyps, dryness and mold sensitivity. Diseases such as asthma, immune deficiencies and immotile cilia syndrome are often associated with sinusitis. In many people with sinus problems, the lining of the nose and sinuses is overly sensitive to a variety of factors. Thus there are multiple possible triggers for the development of sinusitis. Worsening symptoms after 5 to 7 days. Symptoms may vary depending on which sinuses are affected. Some can cause upper jaw and teeth pain; some can make you lose your sense of smell. Usually, though, you can't tell from the symptoms which sinuses are affected. Chronic sinusitis, which is often not associated with an infection, may cause recurrent or continuing symptoms that do not respond to treatment. These symptoms are more subtle and generally do not include fever. The symptoms of chronic sinusitis may vary greatly and last for months or years if untreated. People with allergies, asthma, and nasal polyps are more likely to develop sinusitis. Many people with asthma also have chronic sinusitis. People with deficient immune systems, such as those with HIV, are more likely to have sinus problems. Living in an area with large amounts of pollen or pollution in the air can also increase the risk in sensitive people. This may include a combination of medical treatments. Your healthcare provider will treat an infection, if present, and try to reduce the symptoms of a runny or congested nose.